the boulder to be used to hold the plaque. The Friends of Wind Cave National Park and park employees will be busy Sept. 24, National Public Lands Day, replanting trees and unveiling a bronze memorial plaque recognizing Stephen Mather, the first director of the National Park Service. Free cave tours will also be offered that day. After Mather's death in 1930, the Park Service erected bronze plaques in the 27 national parks and 33 national monuments existing at the time. Wind Cave's plaque hung for many years in the breezeway of the visitor center, but when construction started on remodeling the building in 1979, the plaque was put into storage. "After the Ken Burns series on The National Parks, we began receiving calls from people asking what happened to our Mather Plaque," said park superintendent Vidal Davila. "We decided it was time to bring it out of storage to honor this man who did so much for the country. 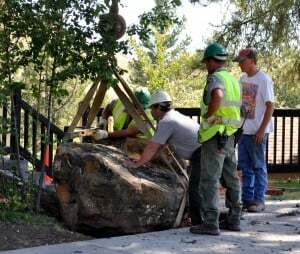 The plaque will be installed on a boulder next to the visitor center." The newly formed Friends of Wind Cave National Park will assist with the replanting of trees on the visitor center lawn that died a few years ago. These trees were originally planted by the Civilian Conservation Corp in 1935 and were part of the park's cultural landscape. Davila continued, "Everyone is invited to assist our Friends group with replanting trees and unveiling the Mather Plaque. Replanting begins at 10 a.m. and the plaque will be unveiled at 11 a.m. The park will provide the necessary tools, and participants should come dressed for the weather and have work gloves with them." Free tours will also be offered that day. Tours last an hour and fifteen minutes and will be offered throughout the day, with the first tour beginning at 9 a.m. and the last tour leaving at 4:30 p.m. Visitors will walk along the Natural Entrance Tour and view boxwork for which the cave is famous. This half-mile tour is moderately strenuous with approximately 300 stairs, most of them going down. The cave temperature is 53ºF. A light coat or sweater and sturdy walking shoes are recommended. All tours begin at the visitor center, and free cave tour tickets will be issued on a first come, first served basis. This event can be extremely popular resulting in long wait times and possible "sold out" tours.